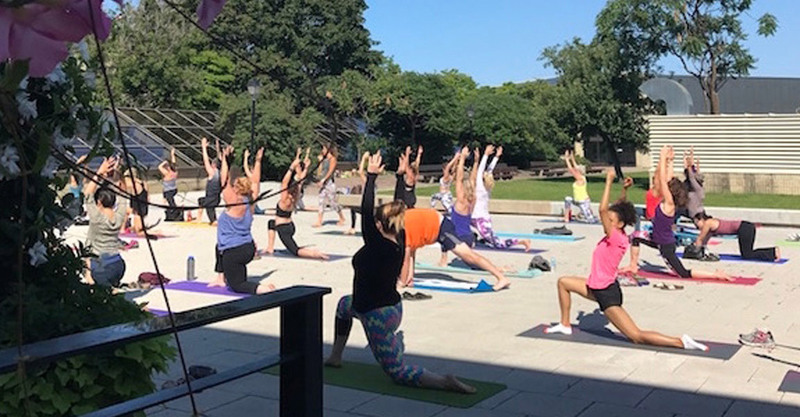 In June of last year I was asked by Tracy Billows, owner of Yogatown, along with the Nordstrom athletic department, to lead 3 yoga classes on the Nordstrom terrace. Although reluctant, I responded to Tracy’s email with a resounding “YES” almost instantaneously! I knew I was given this incredible opportunity because I could handle it and I also knew I had to push through feeling uncomfortable about teaching to a large crowd. Before teaching, I was nervous presenting or speaking in front of groups. In fact much of my delay in becoming a yoga teacher for the last 10 years came from my innate fear of presenting in front of a crowd. It’s incredible to think that are fears are powerful enough to hold us back from our dreams. All this to say that after the first event on July 9, I had an incredibly proud moment teaching on the terrace to over 75 students. The sun was shining, the feedback was positive and all went off seamlessly. With 43 years of wisdom and experience behind me, I have never felt more confident to push through these moments of fear and dive right in regardless of reticence. HUGE life lesson ; be fearless, lean into opportunities, believe that you can handle what you have been given, know that it’s never as scary as it seems and … it feels SO good to conquer a fear. Let me leave you with one question: if you knew you could not fail, what is one thing you HAVE always wanted to do? What are you waiting for?